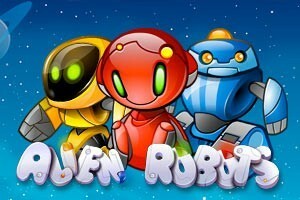 NetEnt has earned a reputation for creating some of the most ambitious and graphically stunning 3D slot games, and Alien Robots is just another fantastic example of that success. The game is available in a practice mode as well as a real mode, and practice play is a great way to get accustomed. 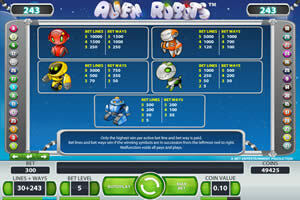 Alien Robots provides 30 bet lines as well as 243 additional bet ways, which you can activate by doubling up. Winning bet lines have a five-symbol pattern from left to right. Straight across on either the first, second and third rows are the most obvious winning lines, but there are 27 other less obvious patterns as well. Bet ways, on the other hand, only require three symbols to pay out, and those matching symbols just have to appear on the first, second and third reels. 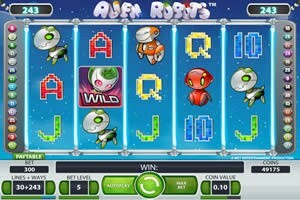 Alien Robots oozes charm, but it’s perhaps those 243 additional ways to win that it set it apart from so many other online slot games. 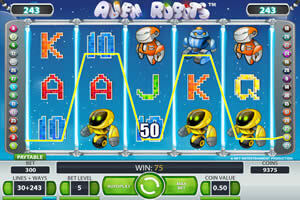 NetEnt announced Alien Robots as a “tribute to robot fans.” The goal was to create a Space-Age-themed slot machine were the robots took center stage. An interesting note is that the robots presented here find more inspiration in modern animation, such as Disney’s WALL-E, then they do with the robots commonly associated with the Space Age, such as Robby from Forbidden Planet. That’s not to say that NetEnt forsakes this aspect of the genre entirely. They clearly hint at a pulpy story here. The wild symbol contains an alien with a brain encased in a glass helmet, and the scatter symbol depicts an armada of spaceships presumably doing battle with the robots below. These robots are clearly the good guys, and there are five unique forms: red, orange, yellow, green and blue. As mentioned, there are 30 bet lines and 243 bet ways. If multiple bet lines hit on a single spin, you only win the most lucrative. The same is true for bet ways, but you can win a line and a way on the same spin. The top payout is 10,000 coins on a bet line and 1,500 coins on a bet way. If you hit three, four or five scatter symbols anywhere on the board, then you earn 10, 20 and 50 free spins, respectively. The scatter feature remains active during free spins, so you can continue to earn more. The wild symbol can substitute for any symbol outside of the scatter. Wild symbols during free spins are sticky, which means that they expand the entire length of the reel, and they remain for one addition re-spin. Alien Robots gives you many different ways to win, but it does without being overly complex. The small coin size is just a penny, which means that you can activate the 30+243 mode for just 60p. Nice thing about 30+243 is that you win on a fairly consistent basis. It may not always be a big win, but at least you’re not experiencing long ruts at a time. The free spin mode is a great addition as well. It’s easy to recognize how its set off, and once you’re in that free spin mode, chaining additional free spins in quite exhilarating. On a free spin re-spin with the sticky wild, it’s hard not to win.